Cold, whether due to the weather or due to air conditioning, can bring aches and pains--especially for someone with fibro neuralgia or arthritis. Electric heating pads can offer comfort and helps ease those pains, but if you accidentally go to sleep with one, it can cause serious burns. One heating pad that you might consider is a rice pack heating pad. To make one of these, you need two types of fabric, cotton or cotton blend, and fleece. Decide on the size you need, and cut four pieces that size. Stack them together in this order: a fleece piece – won’t show so it doesn’t matter which direction it goes, a cotton or cotton blend piece, with the right side up, a cotton or cotton blend piece, with the right side down, and then another fleece piece—again, this won’t show so it doesn’t matter which direction it goes. Pin the four pieces together. Starting about two inches from the center of one edge, sew around all pieces, ending the sewing three inches before you get to the starting stitches. Be sure to use locking stitches at the beginning and ending of the seam. Clip the corners to make the corners less full when they are turned. Turn the sewn piece inside out, with the two cotton or cotton blend fabrics on the outside. Use a pencil or knitting needle to push out the corners neatly. The amount of full grain white rice you need depends on the size of the heating pad you are making. Fill the pad with rice until it leaves only about 2 inches of free space at the top of the pad. Fold the seam fabric to the inside, pin, and carefully stitch the opening closed, catching all four layers of fabric. You may need someone to help hold the pad while you are sewing it. Make sure the seam you sew is locked at both ends to prevent the seam from coming undone. 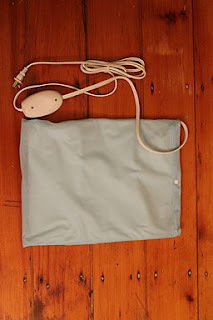 To use the heating pad, place it in the microwave oven for 30 seconds. If it is not warm enough, increase the time in the microwave oven until the pad is as warm as you want it to be. However, it is recommended to place the bag on the inside of your wrist for at least a minute to be sure it is not too hot to place on someone who might not be able to tell if they were burning. The fleece will help prevent burns, but burns can still occur if the pad is placed in the oven for too long. This pad will hold heat for a long while, providing relief of minor aches and pains. If you have recurring or unusual or unexplained pain, be sure to see a physician before continuing to use the heating pad. This pad can also be placed in the freezer to be used as an ice pack. In this instance, the fleece will help prevent freezer burns on skin. However, to prevent frostbite, you should not use the bag as an ice pack for more than 20 minutes at a time. After twenty minutes, remove the ice pack for at least 10 minutes before reapplying. Again, your doctor is your best resource for pain control. Be sure the heating pad or ice pack, as it may be, does not get wet. When rice gets wet, it swells up. The bag will usually rip open and you will have a mess to clean up. If the bag gets wet, and does not rip open, it will not hold heat or cold as it did. It will, however, mold, so it is important to keep the back dry. Thanks for this great info, I keep several heating pads as I get cold during the winter while I’m on the computer so I pop them into the microwave and put them on my shoulder and back or if I have shoulder pain I use them and my husband also uses them, I would be lost without them.